Until I have a chance to dig deeper into Butterick's history, I'll date this one after 1887, but prior to 1903, as that was the year the company's New York offices moved to a new building at Spring Street in New York City. Undergarments are notoriously hard to date. The illustration looks earlier rather than later to me. In some of the comments for earlier posts we've discussed how home sewing patterns sometimes survive more by chance than by design. My local Goodwill store uses sewing patterns for wrapping glassware, for example. This one seems to have just barely avoided being destroyed by time and inattention. 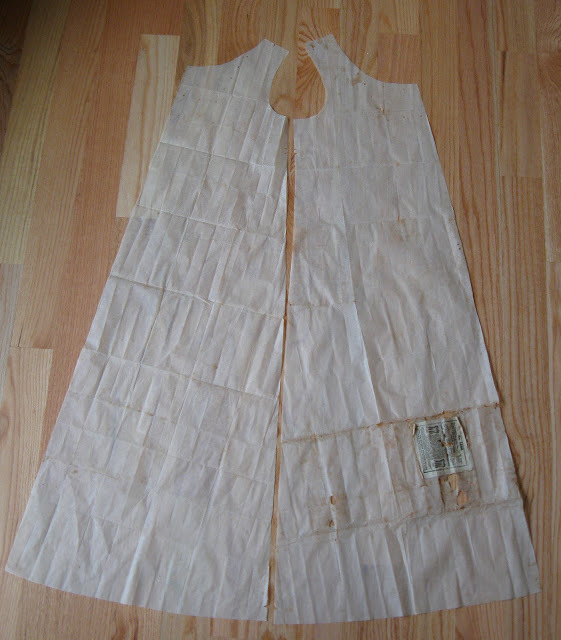 Typically these early Butterick patterns arrive folded into a packet that measures about 5 inches square. Envelopes don't seem to have been supplied, and separate instruction sheets won't appear for another twenty years. (The Shawl and Traveling Case 4514 pattern dates to about the same time.) My guess is that at some point this pattern was rolled up and subsequently became squashed at the bottom of a drawer or shelf. Mice or bugs or both could have attacked the glue used to attach the label to the pattern. Here is how the pattern looked when I first unfolded it. And here it is after a careful pressing with a cool, dry iron. 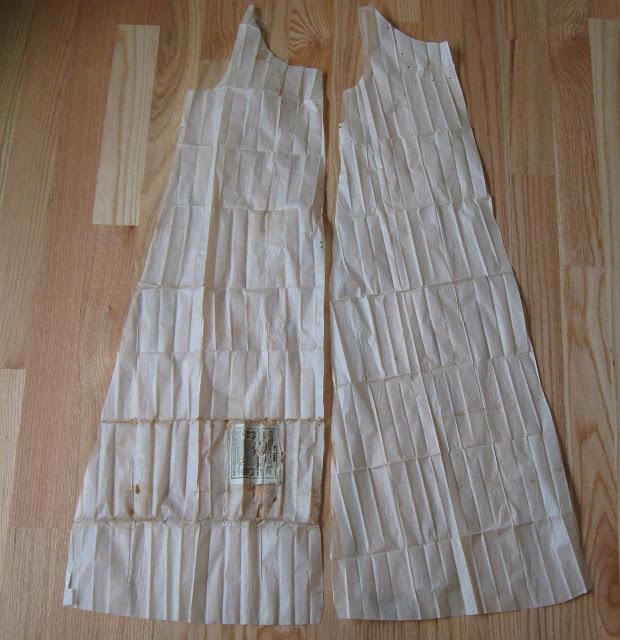 (I've rearranged the pattern pieces to reflect the way the chemise would be put together.) The pattern pieces actually show few signs of use. Outside of the damage caused by poor storage conditions, there are almost no tears or pin holes, and the notches are still crisply cut. Note the notch at the bottom indicating the hem line. 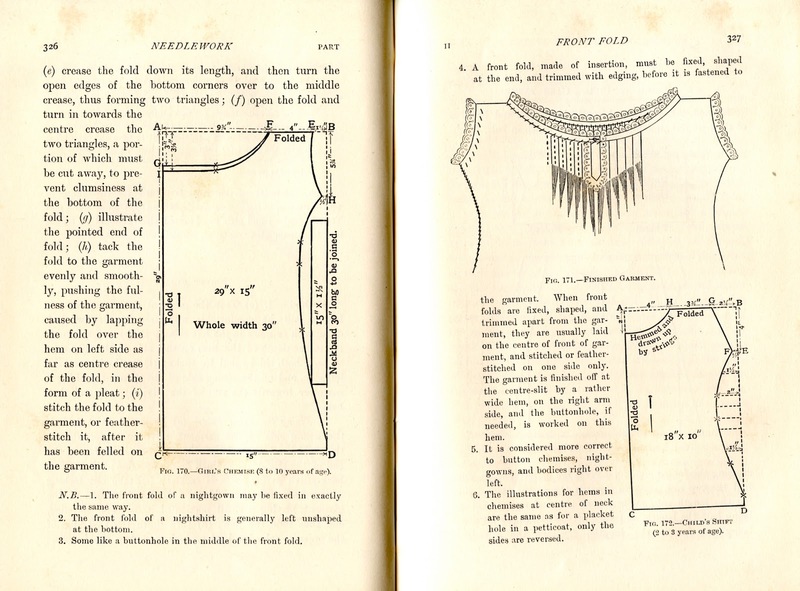 This is about as simple a pattern as you can get for a chemise, and home dress-making books of this period usually give ample instructions for drafting a chemise pattern on your own. The seam allowance of only 1/4" seems rather narrow if the maker intends to fell the seams, as should be done for body linen. Note that yardages are given for lace trimming and insertion, but you're expected to know how to apply this, as well as the underfacings for the sleeve and neck edges. 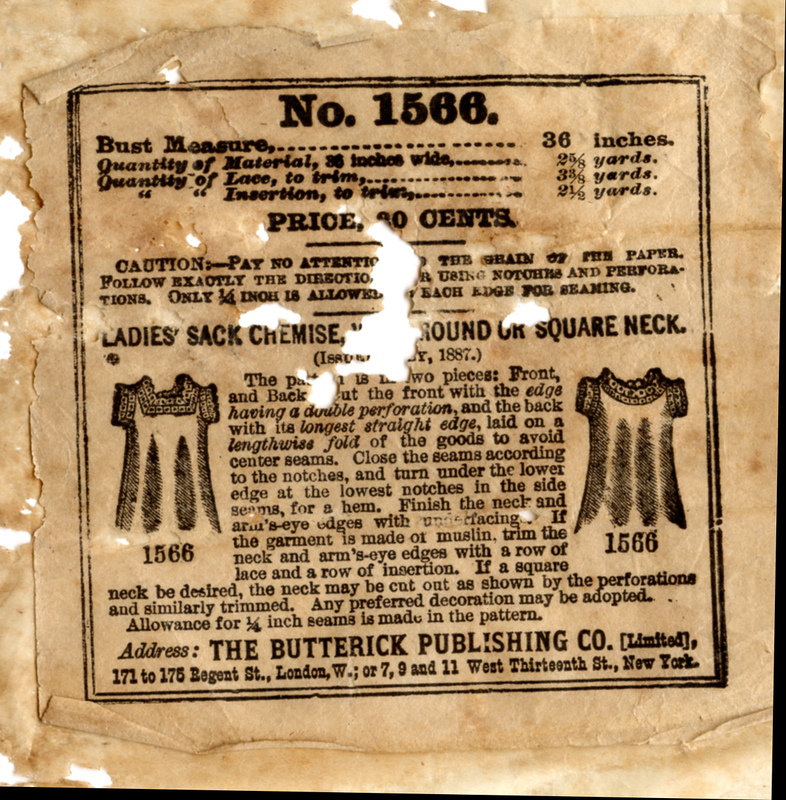 Considering only the materials and not the value of the maker's labor, the home-made chemise is nine cents more than Sears least expensive purchased chemise, but 82¢ less than the most expensive one. What a cool post! Thank you so much for sharing this. I have always wondered what a chemise is exactly for. Is it like a full slip? Is it part of the garment? Is it lounge-wear or a night gown? How exactly does one make a chemise work for them. The chemise is underwear. It and drawers are worn next to the skin. Remaining undergarments (corset, corset cover, petticoats) are worn on top of it. The word chemise is still in use in France, where it means shirt (usually for a man.) A shirt-making establishment, or the practice of shirtmaking, is called a chemiserie. Men's shirts were originally undergarments. It's a bit of an odd name for a girl. I am very curious about how you find such very old vintage patterns. Do you find them at estate sales? I've never seen anything this old and I shop a lot of thrift stores and rummage sales. Very cool to see this, especially how many times the pattern pieces were folded. Wow! I've not had much luck with ironing old pattern pieces. Any tips besides making sure the iron is dry? One heat setting work better than another? Mona - I find most of my patterns on eBay. Now and again I'll find something interesting in an antique shop, but mostly it's all about eBay. Because I collect only the more utilitarian patterns I'm able to focus my budget on these when they come up for bid. Nancy - Ironing old patterns is really painstaking. I think it's helpful to unfold the pattern and let it readjust for a couple of days before trying to iron it. Go very slowly. Working in small areas will help prevent ironing in creases, which are almost impossible to iron out again. And let me emphasize here that I iron the patterns only so that I can photograph or trace them; I never actually sew with these very old patterns! i love that on this post you show the pattern pieces. this one, with all of it's creases, is stunning and inspiring. Hi Andrea, this blog is great and very inspiring. If I may ask, where can I possibly find a good pattern for a pair of men's jeans or work pants or possibly even some khakis? I have been collecting fabrics, rivets, buttons and thread for quite some time, and I feel, I'm ready to finally put a pair together. Hopefully with a little help from my girlfriend. Simon - home sewing patterns for men's trousers are still widely available, and may be a good choice if you don't have a lot of sewing experience. Burdastyle has a good basic men's trousers pattern, number 6014, titled "Jochen". Simplicity 4760 is another contemporary pattern that may be helpful. For a much more retro or vintage look, check out Laughing Moon Mercantile pattern #106 for "California Pants." In all cases I would strongly recommend testing your pattern on some inexpensive fabric before cutting into your good fabrics. I would also recommend taking a look at David Page Coffin's book Making Trousers for Men and Women I haven't used this one, but his earlier book on shirts is excellent. Thank you for the great response. I'll be looking into the patterns, that you mentioned. Thing is I live in Denmark and I have very little access to sewing patterns here. I find most patterns quite bland and when I look in thrift stores I find nothing. I have access to tons of machines, as I attend a kind of fashion school.. But I would prefer using my own machine, which is a very tough, old Pfaff, and I think it can eat its way through more than a couple of layers of denim. So I'm going to make do of what I have and that is denim, twills, ripstop, copper rivets and leather. Hopefully it'll become something somewhat usable. Why not use thrift store pants as a muslin?